Pigtail Flippers are very useful when it comes to your kitchen toolkit. But it can be a bit tricky to use them right and get the most out of this pretty versatile piece of kitchen equipment. Take a look at these starter tips for your new pigtail flippers where we answer all the important questions! When using your pigtail flippers, you don’t want to gore the meat. You just need to pierce a little edge of the food and then flip your wrist. This will turn the food over quickly with minimal loss of juices. 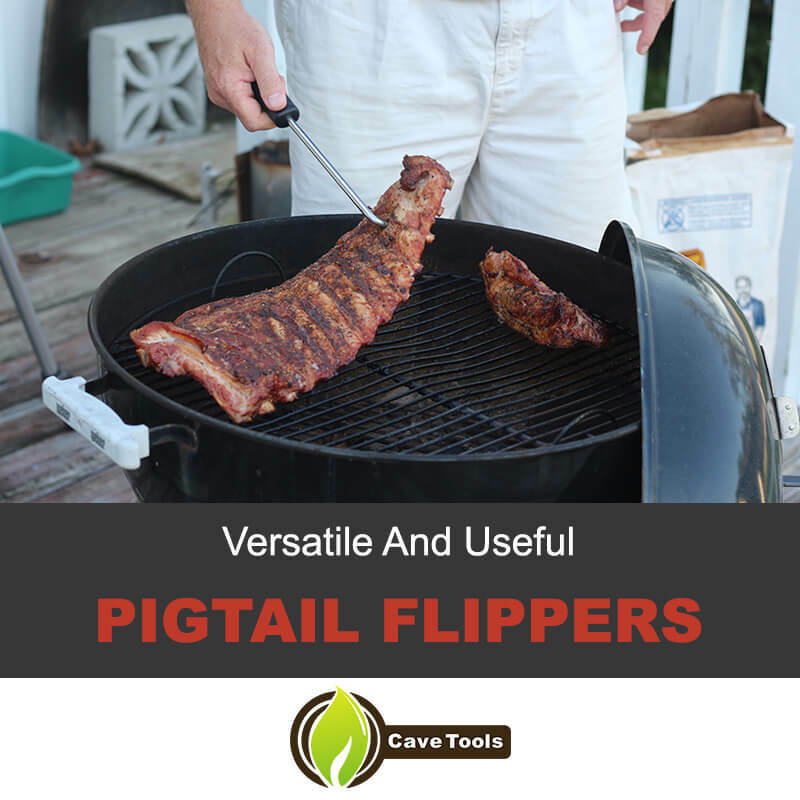 The long pigtail flipper is perfect for use out on the grill. With the extra long handle, your hands will stay safe from the heat. The smaller pigtail flipper (my favorite) is incredibly useful in the kitchen. If you need to grab or flip anything, this is your go-to tool. I use mine all the time to flip my bacon without getting burnt by renegade grease bombs. It’s also perfect for lifting food out of the crock pot. Your pigtail flippers are dishwasher safe for easy cleanup. Will Pigtail Flippers really replace my Spatula, Tongs, and BBQ Fork? What types of foods can I use my pigtail flippers on? The list can go on and on, but here are some ideas to get you started: Ribs, Steaks, Chicken, Hot Dogs, Burgers, Vegetables, Bacon, Wings, Pork Roll/Taylor Ham, Roasts, Sausages, Corn on the Cob, Lifting anything out of the Crock Pot. Why are they called pigtail flippers? How do I use my pigtail flippers? For more tips and tricks make sure to check out the video in the beginning of this article, and if you still have any questions after that, feel free to contact us first to give us the opportunity to make things right.